Large and small and incredibly diverse, our student ensembles range in size from trios and quartets to the 110-member UBC Symphony Orchestra. They play in dozens of traditions and styles, from Bach to Balinese Gamelan and everything in between. Learn more about our ensembles, below, then plan your audition. 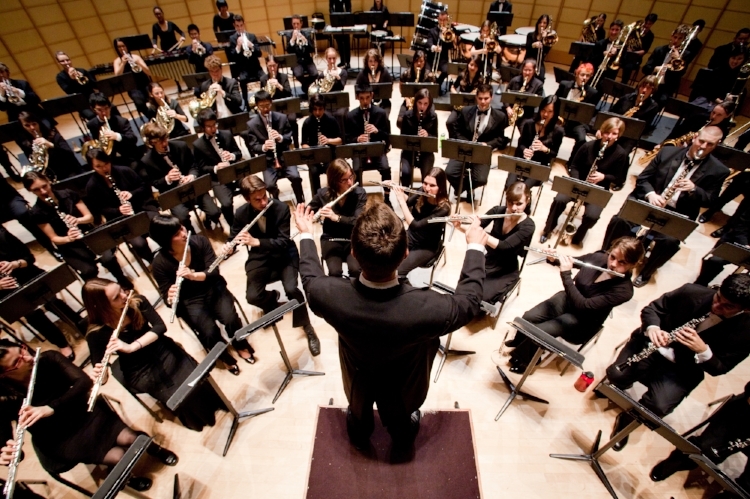 The UBC Bands program includes two ensembles that are open by audition to students in any major field of study: Symphonic Wind Ensemble and Concert Winds. Both ensembles are distinguished by their high level of performance, creative thematic programming, and commitment to contemporary music through commissions, premieres, and composer residencies. There are five choirs in the UBC School of Music. All choirs are open to both music majors and non-music majors! Information on how you can join our ensembles is available here! University Singers (MUSC 153) is the premier choral ensemble in the UBC School of Music. This 40-voice ensemble performs the most advanced and exciting music for chamber choir written in the past few decades, as well as motets and other historically important works. Under the direction of renowned Canadian coloratura Nancy Hermiston, UBC Opera is a 90-member company that stages three ambitious operas every year. Recent performances include The Consul, Le nozze di Figar, Carmen, La Bohème, and Don Giovanni. The UBC Symphony Orchestra (UBCSO) is a 110-member orchestra that performs symphonic works from the 18th, 19th and 20th centuries, giving several concerts during the year, both on and off campus, often featuring soloists. The Orchestra also performs with UBC Opera, and in a annual choral work performance with the University Singers and UBC Choral Union. The UBC African Music and Dance Ensemble (UBC AMDE) was founded in September 2009 by Ghanaian ethnomusicology professor Dr. Kofi J. S. Gbolonyo. The ensemble, which is also a course (MUSC 165D/565D) focuses on music and dances from Africa and specializes in repertoire from West Africa region. Sekaha Gong Gita Asmara was formed in 1996 to explore and present Balinese arts in Vancouver, BC. The 25-member (plus dancers) orchestra has a partly rotating personnel made up of professional, amateur, and student musicians, centered around a strong core membership that has been performing in the ensemble for two or more years. UBC’s Contemporary Players (CP) strive to perform some of the most exciting works of the 21st Century, including works especially written for them right now, plus Classics from the late 20th Century. CP plays numerous concerts every year at UBC’s Barnett Hall and also in such other venues as the Belkin Art Gallery. The UBC Early Music Ensemble is a mixed instrumental/vocal ensemble specializing in the performance of music from the Medieval, Renaissance, and Baroque eras. It provides students with an opportunity to approach aspects of historical repertory and performance in an intimate, practical setting. The aim of the jazz ensembles is to gain an appreciation and understanding of jazz in its many forms. The music studied and performed ranges from the early works of Duke Ellington to contemporary jazz rock fusion and even elements of free jazz. The ensembles perform up to six concerts per year and may include one or two guest artists each season. The P’ungmulp’ae San Param ensemble, meaning “Korean folk drumming troupe Mountain Breeze”, is open to all UBC students, regardless of degree program. It offers the opportunity to engage in a year-long practical study of the Korean tradition of folk drumming and dance known as p’ungmul. The UBC Laptop Orchestra is an ensemble in which students code their own computer instruments or audio/video processes. Students compose solo, small ensemble and full group works, and are expected to perform or provide technical support in all works. This ensemble performs music for the vast spectrum of percussion instruments, including original works from the 20th century, transcriptions of familiar classics, and traditional dance music from Africa and Latin America. The group also encourages the creation of new repertoire for percussion ensemble by student composers. Two concerts per year are scheduled in the Roy Barnett Recital Hall, in addition to other off-campus activities. The Nu:BC Collective encompasses the talents of flutist Paolo Bortolussi, cellist Eric Wilson and pianist Corey Hamm, joined frequently by such eminent artists as violinists Jasper Wood and Eugenia Choi, violist David Harding, and clarinetists Francois Houle and Cris Inguanti. Nu:BC’s critically acclaimed concerts have featured repertoire from exciting and influential contemporary composers from Canada and abroad. Erhu and piano virtuosos Nicole Ge Li and Corey Hamm began PEP to explore the fascinating blend of these two iconic Eastern and Western instruments. The blend is not only a tonal and musical one, but also cultural. PEP is delighted to see composers deal with these elements in such different ways.